In the SEC filing, Apple notes nine proposals to be discussed and voted upon. The Apple Board of Directors is recommending that shareholders vote in approval of the election of eight nominees to the board, ratification of Ernst & Young as Apple's public accounting firm, and approval of the proposed executive compensation. The fourth voting item is a request that shareholders ratify a one-year cycle for votes on executive compensation packages and plans. The board is recommending that shareholders vote against five proposals by other shareholders, including one regarding diversity among senior management, and four entitled "Charitable Giving - Recipients, Intents and Benefits," "Executive Compensation Reform," "Executives to Retain Significant Stock," and "Shareholder Proxy Access Amendments." The "Executive Compensation Reform" line-item claims that Apple lacks "fair, just and ethical compensation principles" and was filed by Shareholder Jing Zhao. Zhao is the founder of the Comparative Policy Research Institute, a self-proclaimed "independent think tank focusing on comparative social, economical, political, and industrial policy issues" comprised mainly of Chinese researchers, scientists, economists, and engineers with experience in Japan that reside mainly in Silicon Valley. 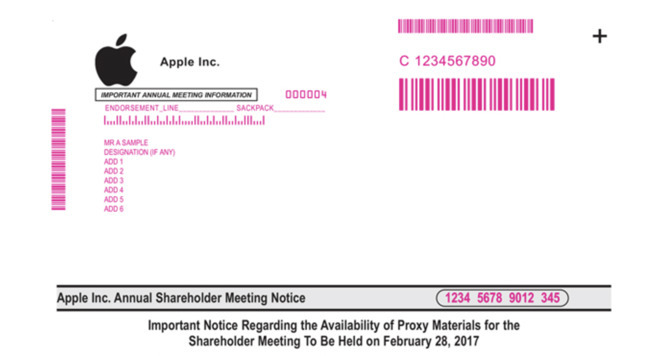 The National Center for Public Policy Research proposed the Charitable Giving edict, requesting that Apple provide an annual report detailing "the company's standards for choosing recipients of company assets in the form of charitable contributions." Also demanded are follow-up reports confirming if contributions are used for stated purposes by the recipients. Apple claims to already far exceed requirements for reporting on charitable giving. Regarding Apple's suggested board members, there are no planned shake-ups. The eight nominees presented for the board continue to be James Bell, Tim Cook, Al Gore, Bob Iger, Andrea Jung, Art Levinson, Ron Sugar, and Sue Wagner. Proposal 6 before the shareholders is seeking to "increase the diversity of senior management and its board of directors" by implementing an "accelerated recruitment policy" of under-represented groups in Silicon Valley as a while, and Apple as a company. Apple is requesting shareholders refuse this proposal, as its "holistic view of inclusion and diversity" generates opportunities not just in Apple, but beyond Cupertino as well. The company also notes that Apple's hiring trends for the last three years are showing steady progress towards a diverse workforce, as requested by the proposal. The same requester proposed something similar in 2016, and received less than 5 percent of the votes cast.